I recently talked to Cheltenham Sceptics in the Pub – which was a great evening, with some livelydiscussion. Now, I’ve blogged about happiness before – but I had some thoughts as a result of this talk… One of the great concerns I’ve had about all this movement for ‘Happiness’ is that it seems to evade the issue of whether we deserve to be happy – about the primary connection between Virtue and Happiness. If we stop caring about others – just pleasing ourselves – we can be quite cheery can’t we? The example I use in the book is the guy at the end of the Woody Allen movie Crimes and Misdemeanours – he seems content, happy and to have got over his murderous acts by forgetting about them.. Creating a happier society for everyone. That sounds much more like it, doesn’t it? Members of the movement make a simple pledge: to try to create more happiness in the world around them through the way they approach their lives. We provide practical ideas to enable people to take action in different areas of their lives – at home, at work or in the community. We hope many of our members will form local groups to take action together. We have no religious, political or commercial affiliations and welcome people of all faiths (or none) and all parts of society. We were founded in 2010 by three influential figures who are passionate about creating a happier society: Richard Layard, Geoff Mulgan and Anthony Seldon. What lept out at me here was the section that said ‘We have no religious, political or commercial affiliations‘. 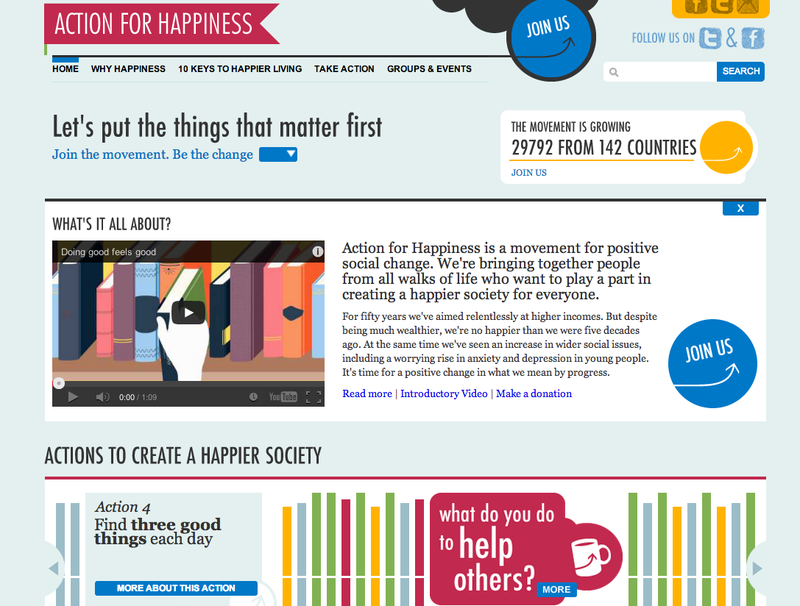 Does that mean Action for Happiness has no political position? If we are going to spread happiness by more than charity donation, by holding open doors and being less of a curmudgeon – being overtly political, alleviating income and health inequality, establishing less Patriarchal relations between genders, fighting racism and ending privilege seem quite important too. There is some thing oddly apolitical about the claims of the Happiness Movement, faintly neo-liberal or post-ideological too. At their guidance, there are some claims about neuroscience that I’m not qualified to judge (“Altruistic behaviour releases endorphins in the brain and boosts happiness for us as well as the people we help.”), but these ways of helping – while undoubtedly noble and virtuous – seem like rather thin responses to a world riven by material poverty. 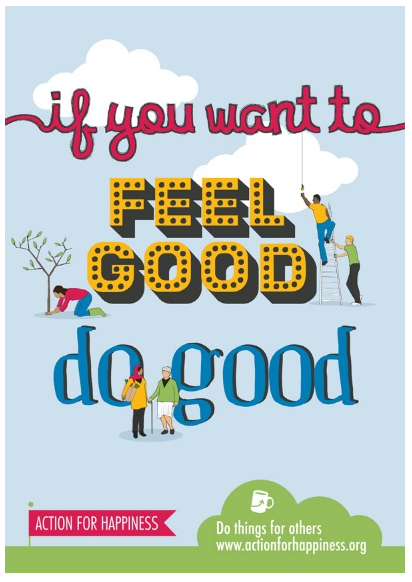 Shouldn’t I not only show my care for others by, as well as volunteering, helping my neighbours and the things in the poster below, also getting my hands dirty in the real work of happiness: and that work is called politics. And they say this when you click through. Which seems to be saying we can learn to be compassionate because our brains can change AND our brains are predisposed towards helping others. One or other claim would be more sensible. And.. http://www.newyorker.com/online/blogs/newsdesk/2012/12/what-neuroscience-really-teaches-us-and-what-it-doesnt.html – some scepticism about simplistic claims regarding neuroscience..